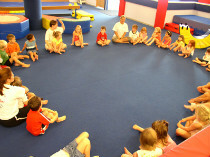 Our 4, 5 and 6 year old Gymbugs™ will enjoy three hours of fitness, frolic and fun under the supervision of our highly trained staff in our air-conditioned facility. Activities will include Gymnastics and Tumbling, Arts & Crafts, Games, Story Time, Singing, Dancing and more!! Snack time will also be a part of the class (snacks to be provided by the parent). Flexibility: 18 or more classes to choose from, you pick the amount you want to participate in. In any order! Freedom: Up to 3 hours of time for yourself . . . with the comfort of knowing your child is safe under the supervision of our highly trained staff! The Facility: Up to 3 hours of fun and social interaction in our state-of-the-art facility! The Program: A structured, instructional,non-competitive, custom designed program focused on developing your child's creativity and gross motor skills! The Staff: Professional, Enthusiastic, Supportive! All Rights reserved. Copyright Rolly Pollies International, Inc.